I signed up for the Army without any idea of what I was signing up for. Sure, my dad is a living WWII vet, but I didn’t understand what it meant or how it would come to influence who I am. After commissioning, my journey started to take a new shape. The seeds of leadership were being planted unbeknownst to me. At 21, I was leading a platoon of men, and at 24, I was flying medevac helicopters. As I took on roles of increasing responsibility, it became apparent that people depended on me as a leader. The people I led expected more from me than just giving commands. They trusted me to set goals, provide direction, and make sound decisions. Looking back, that is an awesome responsibility – especially for someone so young. The decisions I made could mean life or death. What does that mean in the bigger scheme of things? When I flew medevac missions, it started to become clear that the role of the leader is actually to serve. I joined the U.S. Navy six days after I graduated from high school and served for five years. I just knew that I wanted to do something meaningful and make any difference I could in the world. For example, I was sent to Edzell, Scotland for two years to monitor intelligence during Operation Desert Storm. I have been with Celerity for over five years, and I have always enjoyed being part of an honorable company that really cares about its employees. As a paratrooper in the U.S. Army, I had the privilege of serving with great soldiers of different stripes from all over the country and across the globe. Thanks to the generosity of the G.I. Bill, I earned a bachelor’s degree in finance. I have worked for Celerity for eight months as an analyst and am enjoying the opportunity to learn and grow in this industry. 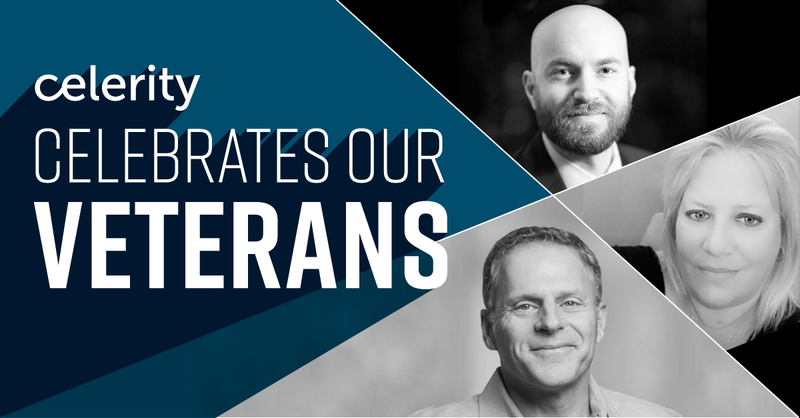 Thank you to our team members who served our country and every veteran who has made a difference for America. Our team will be making donations of cold weather gear to PickUpPlease.org from each Celerity office in your honor. If you're a veteran interested in joining our team, please visit: www.celerity.com/careers.